Click to viewWe've been fiddling with Time Capsule since it arrived this AM, and so far it works as billed, clean and easy. The star of the show is really the new AirPort Utility software, which now comes with some neat tricks for the network-phobic. Most of all, we're learning the ins and outs of adding external drives, using networked printers, and setting up that potentially nasty initial data dump. We've actually set up the Time Capsule several different ways already, as the only router in the network, and as an Ethernet-linked node on an existing wireless network. The start-up wizard in AirPort Utility asks you plainly what you want to do, in increasing steps like a Choose-Your-Own-Adventure book. I know some of you don't need that kind of child's play, but this kind of thing will even help you when you tell your mom to get one of these and realize you won't have to do tech support too. • Set aside an entire night to get it done. • Try not to interrupt the first dump, as the subsequent file-integrity check will take a long time too. But say you buy the 500GB Time Capsule, and want to use an external 1TB drive to do all your serious backing up. When you connect it via USB, it is automatically visible in both the AirPort Utility and the Time Machine on your Mac. What you can't do is merge the two to make one massive 1.5TB volume, though. You have to choose one or the other. 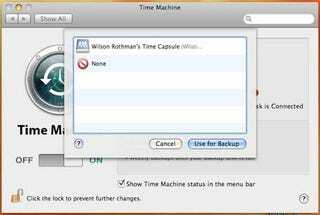 In some cases, you may want to connect the USB drive you already use for Time Machine to the Time Capsule, to simply make the process wireless. Bear in mind that if you do that, you still have to make the massive initial dump: Time Capsule won't recognize that drive as your previous Time Machine drive, but just as new storage that you can use. The internal drive and any external drives can be seen as standard network drives, too, across both Mac and PC platforms—checking the guest friendly option in AirPort Utility's disk settings is helpful there. Speaking of PC compatibility, Apple appears to be promoting Time Capsule, at least by word of mouth and in all the support literature, as a dual-platform product, even though its core Time Machine software is not available to Windows users. You can use third-party backup software and select Time Capsule as the target drive, though there are certainly many competing products that will let you do this for cheaper. The only significant problem I've run into is the networked printer. I connected a printer to Time Capsule that I had set up for local use on my Mac. Time Capsule recognized it immediately, and the printer selection on the Mac itself showed it just fine, but when I went to actually send over a print job, I got an error that the printer was offline. (Eddie Izzard fans would've appreciated the ensuing angry outburst: "Not offline! No. Online. Control-P Print!!") I don't blame Time Capsule yet. I'm going to try it with some other printers soon, and will get to the root of it. We will continue to test this and alert you to any issues, but in the meantime it's safe to say that this is a worthwhile product for people who have the money and want the convenience. How often do you refuse to connect the USB to your backup drive because it would hamper your style? How often are you afraid, after a long period of not backing up, of the time it may take you to perform a backup. Those issues go away with Time Capsule.